January/February Quirky Kits Full Reveal! For this kit I really wanted to pick out a colour to warm up the winter time so I began with yellow. One trend that we delved into last month and that's still hot going into this year is mixing bright colours with grey so this month you'll also find a little bit of grey in your kit. It'll mix up with all the bright colours in the kit to give you a modern but still classic look. As we're going into the month of February love is in the air and I think it's great to make pages about things we love. One thing we all have in common is our love of paper craft so I figured why not make this one 'For the Love of Paper'. 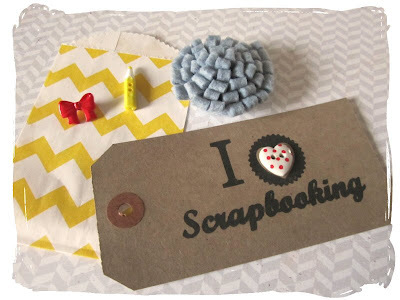 You can make up all kinds of pages about things you love and maybe one of them could be showing your love of paper or as the custom tag says scrapbooking! I had another couple of custom things made, the little flowers, the tags and the custom dyed lace too in lovely bright vibrant turquoise that will give a contrast to all the colours in the kit and will of course compliment the yellow papers :). I particularly like the blue with the grey chevron in the Echo Park paper. Chevrons are a huge trend right now too, (I've since been spying lots of chevrons in the CHA peeks this week!) so we have lots of lovely chevron patterns popping up. The cardstock I decided to keep really neutral to allow all the patterns of the paper to shine through. There's some kraft and vanilla and also a cool Bazzil called 'Sawdust' that's kind of like natural handmade paper with fleck bits in. The alphabet stickers are also neutral but they have a wonderful polka dot texture on them to give them interest. Last but not least we've got some fabric again in this kit, a pretty grey polka dot and to throw in another quirky neutral some denim! Denim is another one of those brilliant things that goes with everything. It'll be great for making embellishments or just use it like another piece of patterned paper. The other little bit of fabric I've put in is the strip of calico. Have a go at custom colouring it yourself with your own spray mists or ink or you can stamp onto it or paint it or roll it up into a rolled rose embellishment. It's one of those things that you can do a million things with and make it unique to your project :) I really hope you enjoy using this one as much as I've enjoyed putting it together. Paper Rainbows picks up on all the things Love of Paper has but just on a slightly smaller scale :) I've picked out grey and pink as the main colours and thrown in a splash of red and yellow to add quirky drama. The custom felt garland you can customise even more if you want to adding little cut out bits and pieces or beads or more stitching or alphabet stickers etc etc. The Crate Paper boarder stickers are great because there are so many different ones on the one card, you'll be using these for a long time :). Just like the main kit too Paper Rainbows has fabric, it's a super cute polka dot and heart pattern in a vibrant red. Unlike the more neutral fabrics in the main kit with the lite kit, because the papers I've picked out are more subtle the colour of the fabric will really contrast well as too will the fab vibrant yellow cardstock. Subscribers, keep an eye out for your new kit arriving this week. We're nearing new kit time so now is the opportunity to make use of some leftover bits and pieces for me. I usually gather together bits and pieces I've got left in one box so it makes it easier to see what could go together. I've ended up with a real mix up using elements from 'Hazelnut Coffee', 'Glastonbury Fields', 'The Milk Bar' and 'Snow Drifts'. Here are some ideas to try taken from the layouts. How about mixing up leftover thin strips of paper by layering them up together and adding some washi tape and stitches to the mix? 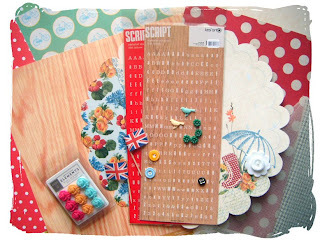 Here I've used some of the journalling stickers from 'The Milk Bar' Quirky Kit as layers in the background of the page. I also took note from the ink spray on the stickers and added more ink painting it on my page edges and flicking it on with my paint brush. I've also used some more of the boarder stickers from the 'Glastonbury Fields' Quirky Kit Lite covering some of them with patterned paper scraps to give them a different look. How do you store your bits and pieces of older kits, do you bundle them together? Have a go mixing up a few different kits to see what you can come up with. P.S check out Twitter today for another sneak peek of the upcoming kit 'For the Love of Paper'. Tomorrow I've got a double layout idea for you making use of mixed up bits and pieces of older kits but how about looking forward to something new? Here's a couple of sneak peeks of the brand new Quirky Kits! 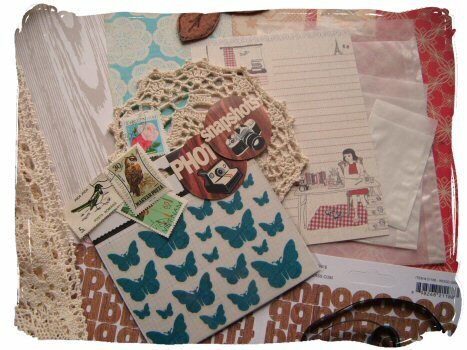 The Quirky Kit Lite this month is called 'Paper Rainbow'. It's a lovely mix up of light airy colours with splashes of brights as demonstrated here with the cool greys mixed with the bright reds and pinks in this peek. The new kits should be ready to go around this time next week so subscribers look out in your email inbox for your shipping notification. You'll be able to change the day your kit is sent out if you need to. Today I'm making a start on a new project, 'A page a month'. 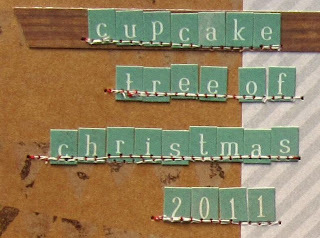 It's a way to both make use of leftover bits and pieces and to document the year in a clear and simple way. I've picked a clean simple format to stick to and set about pre-preparing the album so it's ready to fill throughout the year. For my album I've picked out one I already had and hadn't used yet it's an American Crafts 8.5x11 size ring bound album. I like the ringbinder format because it means I can add more to it as I go along if I want to. To each page I want to add a month so I've picked out the Elle's Studio 2012 Monthly Pennants from the Snow Drifts Quirky Kit Lite. You could also use the callendar cards from the Snow Stories kit too. I've rounded the bottom corners and glued two pieces together back to back as both sides will show. Once it's cut out I've then slid it into a page protector. I've then stitched along the top edge of the paper with my sewing machine. This created the 8x8.5 inch pocket for the pages at the top of the paper strip. For the page base I've just used a piece of kraft cardstock cut to size to fit in the top pocket ready to decorate. I've rounded the corners of these too just for interest. I'm going to add all the decoration on the strip right on top of the page protector but if you wanted to you could add it to the strip first and then stitch it inside your page protector or you could just glue the month detail strip on top of the page protector without any sewing. All ready for my January pages, I'll be making two pages, one for the front and one for the back of each page protector, one for each month to make 24 pages in total. I figure I can always add more pages in between too as I go. I'll add some more of the base pages as I finish them but I'm mostly using Quirky Kit leftovers for this apart from the album and the extra cardstock.All the papers I've used here are from Snow Stories and Snow Drifts. The boarder sticker is from the Glasonbury Fields Lite kit. 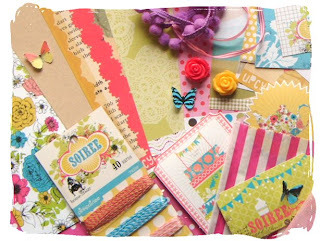 I was so excited to be asked to design for Quirky kits again, as I LOVE the kits truly. I am not a massive Christmas scrapper - so I was delighted when the kit arrived and it wasn't snowman themed!! Here are some of my pages I have made using the kit. I will be back this week with more pages from the December kits! The trends I highlighted in this kit are still going strong into this new year too, mixing the bright colours with the grey and the airmail stripes. The spring had arrived with the next kit and so we had to 'Put a Spring in Your Step'. With this kit we had an exploration of textures and we looked at another trend that's never really gone away this year, woodgrain patterns. Next to arrive was the summertime and this summer we had a party but no ordinary party a 'Downtown Tea Party'. The idea came from the juxtaposition of a floral fun tea party but with jeans and T-shirts so this kit had two sides to it. This month the first Quirky Kit Lite also made an apperance, 'Glastonbury Fields'. After the fun party it was time to chill so we spent the next couple of months lazing at the seaside and headed to 'The Milk Bar' for an ice cream float. At the end of September the season changed again as we headed into autumn. It was time for comfort food and that came in the form of 'Hazelnut Coffee' and 'Rocky Road'. Part of the inspiration of this kit was also the idea of collecting and picking up on the botanical trend so we had pretty little glassine envelopes, notepaper and vintage stamps and motifs from nature like the birds, flowers, butterfies and more lovely woodgrain. We've come full circle to the last of this years kits 'Snow Stories' and 'Snow Drifts'. So what has been your favorite kit of 2011? More importantly have you got a few leftovers from this years kits? I've got a fun idea for a project to use up mine and I'll share it next week as I start another year long project for 2012, with a 'A Page for Every Month'. SJ should be along shortly with some more ideas too so keep a look out for those. If you haven't already pop your email address in the 'follow the blog by email' button down the right hand side -----> it'll automatically email you new posts so you get all your inspiration and sneak peeks sent straight to you. Speaking of sneak peeks, look out for the peeks of the brand new January/February kits 'For the Love of Paper' and 'Paper Rainbows'. Wishing you a very happy and Quirky new year! Here's a quick idea for a layout made with the 'Snow Drifts' Quirky Kit Lite. 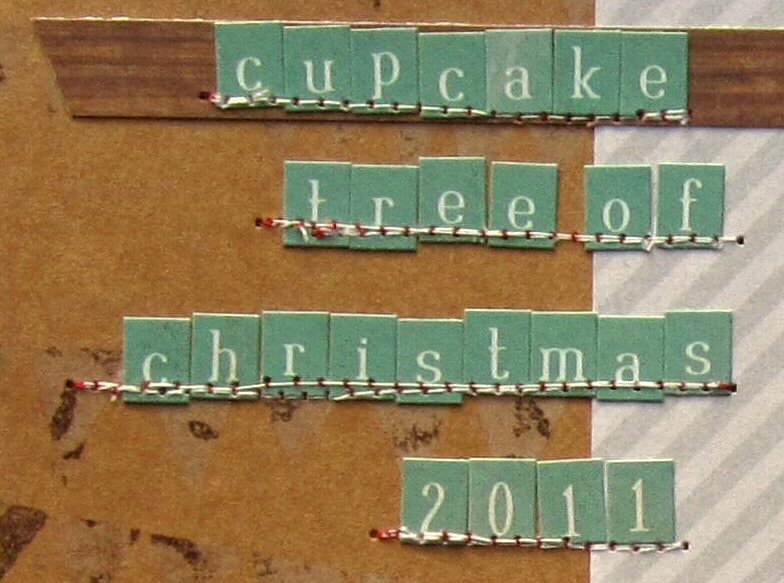 Have you taken lots of snaps to scrapbook over the holiday break? Have a go at mixing in your own accent colour with your kit goodies. P.S I've got some more mini ideas for you coming up soon making use of the calendar cards in both kits.